It's a commonly held belief that Christopher Columbus 'discovered' America. This is wrong on so, so many levels. Firstly, the Americas were 'discovered' by the ancestors of modern Native Americans and First Nation peoples thousands of years before Columbus. Secondly, Christopher Columbus wasn't even the first white man to 'discover' America, because in the early 1000 CEs Viking explorer and Christian missionary Leif Erikson stepped foot on what is now Newfoundland, Canada. "...tall and strong and very impressive in appearance. He was a shrewd man and always moderate in his behavior." What is certain is that in 1000 CE Leif set sail for Norway. He was blown off course somewhere in the Hebrides, and had a son with Thorgunna, the daughter of a local chieftain. When it came time for Leif to set sail again, Thorgunna asked to accompany him, but Leif refused. When Thorgunna told him that she was expecting a child, Leif refused to take responsibility for the child. Thorgunna, however, swore that she would send the child to Leif in Greenland as soon as she was old enough, and she followed through on that promise. In Norway, Leif met with King Olaf Tryggvason, who had been converted to Catholicism. 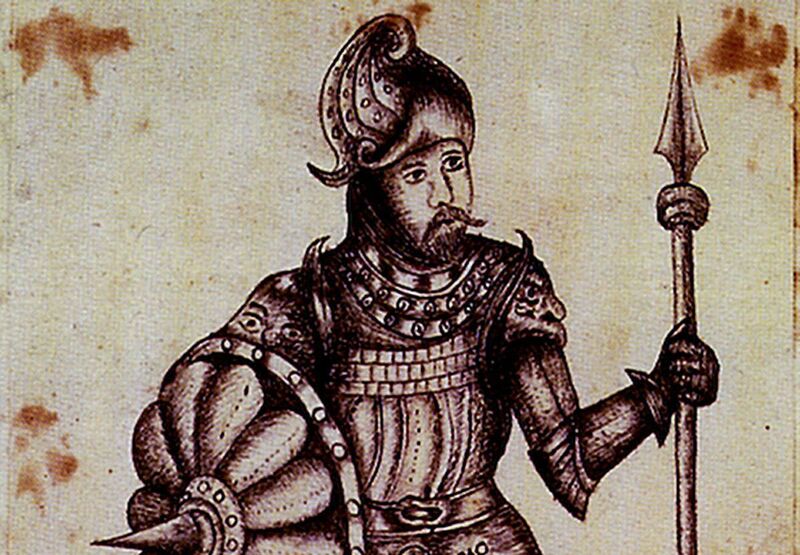 Olaf soon converted Leif as well, and tasked him with spreading Christianity back in Greenland. With this charge, Leif went sailing back to Greenland. Here is where accounts diverge. The Saga of Erik the Red claims that on his way back from Norway Leif was blown off course yet again, and saw the shores of North America. 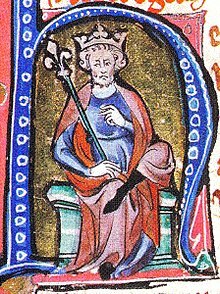 According to the Saga of Erik the Red, Leif never actually set foot on North America, but left it to his younger brother, Thorvald. 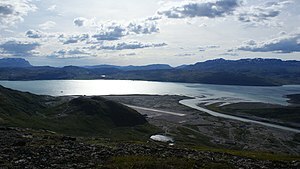 However, the much more reliable Greenland Saga says that Leif was back in Greenland when he heard tale of a new land in the west from Bjarni Herjolfsson. Bjarni Herjolfsson had seen the coasts of what we now know as the east coast of Canada, but hadn't landed to explore. The people of Erik's court mocked of him for not having landed, and soon Leif was determined to do what Bjarni had not. Sometime in late summer or early fall, Leif set off for the lands to the west with a new ship and a crew of 35. Leif had originally asked his father, Erik, to lead the expedition. Erik had demurred, saying that he was getting to be too old for that sort of nonsense, but Leif insisted. According to Leif, Erik had the most luck in the family, and luck was needed for this sort of expedition. 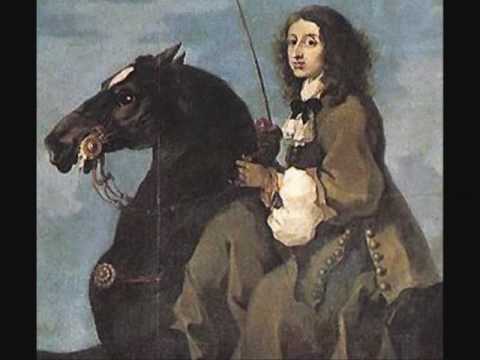 Erik reluctantly agreed, but on the day that the voyage was to have left Erik was thrown from his horse, and broke his leg.This left Leif the leader of the expedition, and off they went. Leif's crew first landed in what is most likely modern Labrador. Leif named it Helluland, and essentially called it a wasteland. He was unimpressed by it's glaciers and lack of plant life, and so set off again. This next time they landed in a place they called Markland. It was a flat and wooded area, most likely in modern Nova Scotia. However, Leif wasn't ready to settle down, and he hurried his crew back to their ships. They sailed north again, and docked on a large island. It was here that they decided to settle for the winter. The land was fertile and green, and when Leif sent out exploration parties one of them came back with a vine of grapes, leading Leif to name the place Vinland. Leif and his crew stayed the winter, harvesting wood and grapes to take back with them. When spring came they sailed back towards Greenland, laden with cargo. On their way home Leif and his crew rescued a group of shipwrecked people on a reef. It was his discovery of these people that earned him the title 'the lucky'. It is about here where the record of Leif Erikson ends. 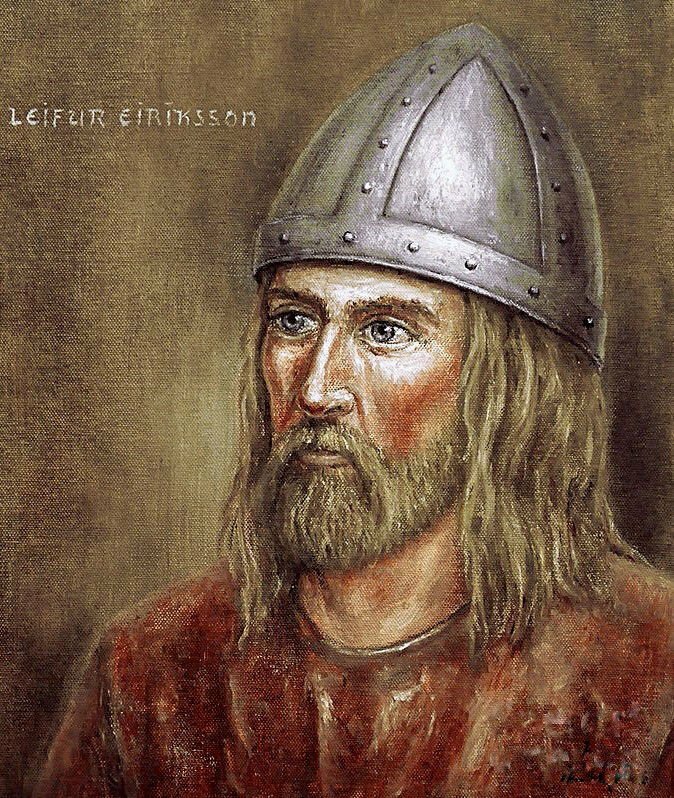 He is known to have died in 1025, and rumored to have succeeded his father Erik as chief after Erik's death, but the adventures of Leif Erikson seem to have ended after he came back from Vinland. For many years Leif was forgotten about. 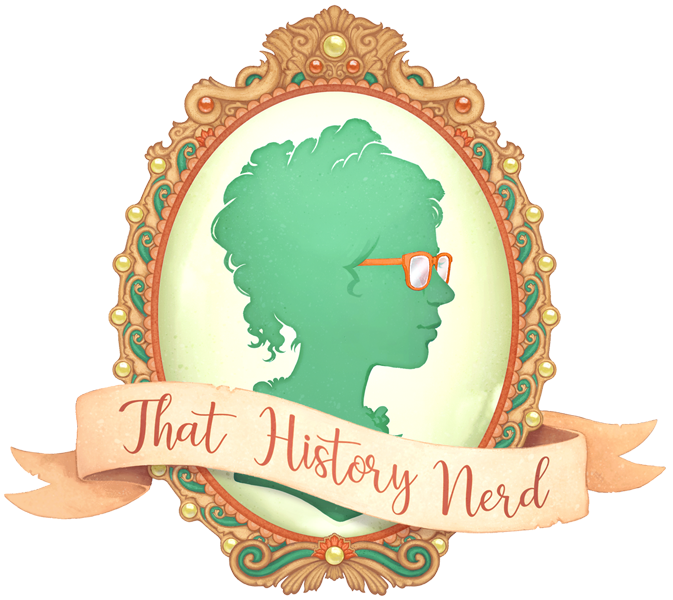 His claims about having discovered a land were difficult to prove, and historians squabbled over where it could have been. However, in 1960 the remnants of a Viking settlement was found in L'anse aux Meadows, Newfoundland, leading many to believe that Newfoundland is the country referred to as Vinland. 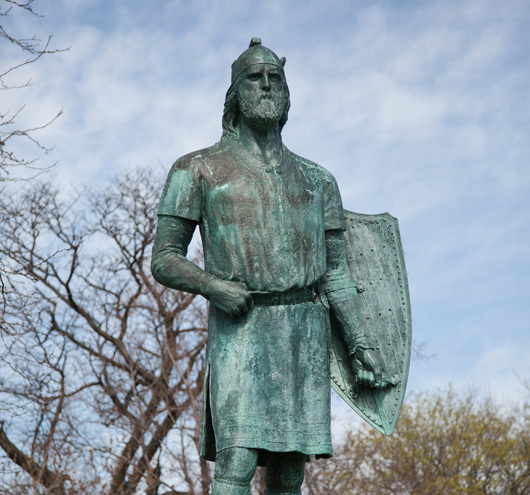 Leif Erikson was later awarded his own holiday, and to this day Leif Erikson Day is celebrated (well, mostly ignored.) every October 9.